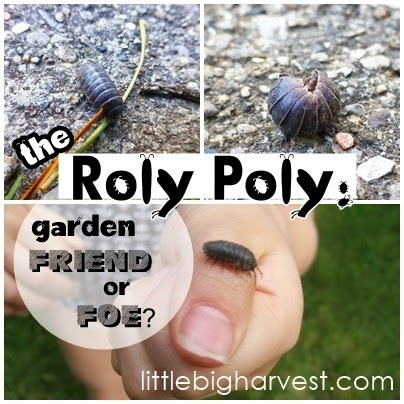 little*big*harvest: The Roly Poly: Garden Friend or Foe? Every time you upturn a rock, small log, or flowerpot, you see dozens of them. They are a favorite for kids because they are so easy to pick up and examine, and the way they curl up into a ball is quirky and delightful. Are they bad for the garden? The answer is "not exactly." We need roly polies as much as we love them. However, they can cause issues--read on for more! As I started to get serious about gardening, I began to notice that roly polies loved residing in some of my garden beds. I dug into the soil with my hands in late spring to plant green beans, and several roly polies scattered--some of them huge, some tiny. I wondered if these little guys were good, bad, or neutral for the garden, and if I should be concerned about the number of them (that particular spring the yard and garden were just saturated with them). Some damning evidence was revealed to me a couple weeks later. The green beans I'd just planted had sprouted beautifully, and were starting to reach to the sky with their first true leaves. One morning I came out to check on the baby plants and most of them had been absolutely decimated during the night. One roly poly still clung to a bean sprout, ready to pose for the photo below. The evidence was too clear--these roly polies could definitely pose a problem. However, I hesitate to call roly polies pests in the same way I'd call a tomato hornworm or a potato beetle a pest. Hornworms and potato beetles are decidedly out to get specific plants, whereas roly polies don't prefer your garden goodies; they only turn to them in certain situations. So there is not a simple yes or no answer to the question of whether they are 'bad' or not. Caught in the act; a roly poly eats a baby green bean plant. 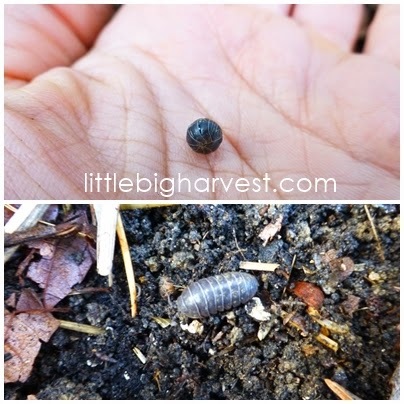 The fact is, roly polies play a very important role in the garden's soil. Like our friends the earthworms, these bugs are some of the first actors on the scene in that beautiful production of humus. They eat dead and decaying organic material, breaking it down and making nutrients available to plants and other organisms. We need roly polies to help the worms and other creatures turn decaying material into soil. But we don't want the roly polies to eat our seedlings or other garden plants. There are ways to balance the scale and to live in harmony with these little guys. If roly polies are composters and prefer decaying materials, then why would they eat green bean seedlings? It's important to note that roly polies are crustaceans; that's right, they are related to shrimp, crabs, and lobster. They are the only crustaceans who live their entire lives out of the water. Though they don't need to live in water, they do need moisture, and lots of it. They thrive in damp, cool places, and they love to munch on damp, rotting organic material. It turns out, if the conditions are right, they will gladly eat your living plants, too. This includes tender succulent green bean and pea seedlings, which sprout in the cool damp mornings of spring or early fall. Roly polies will also gravitate to any fruits or vegetables that are lying on the ground--thus trapping moisture--such as ripening melons, squash, and strawberries. The key to living in harmony with these creatures is to avoid excess moisture in specific situations. Understand why they are eating your plants. The seedlings provide a moist, humid little climate that draws the bugs. The mature vegetables that are laying on the soil are also very attractive--moisture is trapped under the veggies and provides a perfect gathering place for roly polies, in the same way that rocks and logs and flowerpots do! Bean and pea sprouts seem to be the most vulnerable to roly poly munching. This is because they are naturally succulent, and in the case of peas, they usually sprout during the very damp, cool days of spring or early fall. The seedlings are in the most danger a day or two after emerging, when they are the most tender. Sprinkle diatomaceous earth around the base of the seedling. Be careful, though; not enough DE will not dry the soil out enough to deter the roly polies, and too much may harden the soil and make it difficult for the bean or pea to sprout. Pull mulch away from the seedlings until they've grown a few inches to keep excess moisture away. If the roly polies continue to attack, start seeds indoors and then transplant outdoors when the plants have grown a few inches. 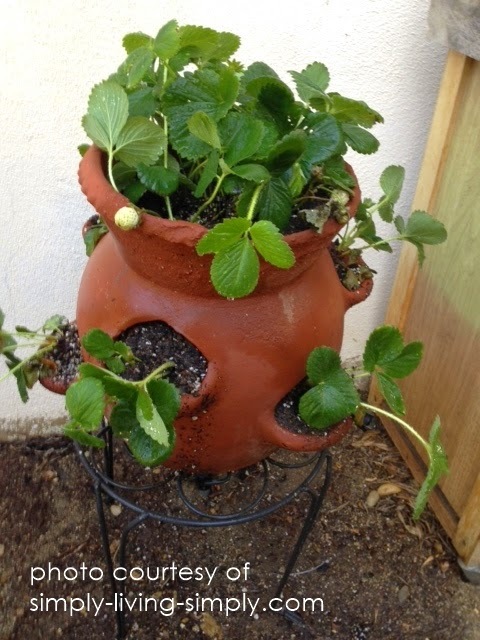 keeps berries off the ground with a planter. 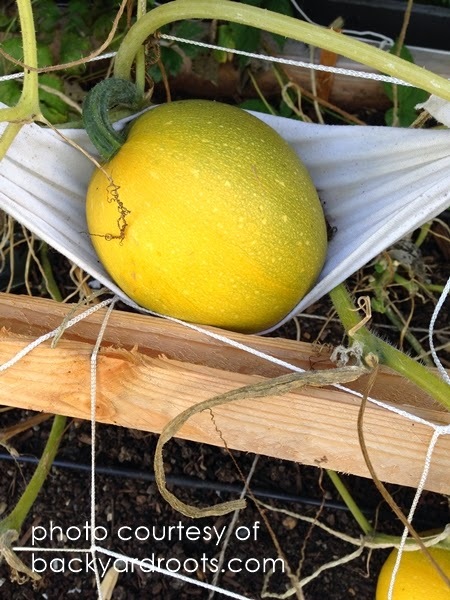 keeps squash off the ground using a hammock. Veggies like pumpkins, squash, tomatoes and anything that lays on the surface of the soil can be a heavenly place for roly polies. They love the trapped moisture and will nibble on the veggies even if they are not yet decaying. Keep your veggies up off the ground, using upturned pots, or by fashionig a simple hammock. Use trellises when you can. Remove any veggies that are decomposing (which is a double delight for the roly polies). Try growing strawberries in a tiered bed, which makes it easier to keep berries off the ground. Alternatively, you can fashion a small support for each plant. Water early so the plants can dry by evening. Remove dead leaves to improve airflow and keep veggies dry. Consider your mulch; you want it to be course enough to let water pass through, in large enough peices that won't pack to create a constantly wet mat at the surface. You want your moisture down in the soil with your plant's roots, not on top of the soil. Incidentally, many of these tips for seedlings and maturing veggies will also contribute to the general health and well-being of the plant. Conditions that are perfect for roly polies are also perfect for many diseases and other pests. Keep enjoying those intriguing little bugs, but don't give them the opportunity to munch on your garden plants. *I always find great advice in the book below, including some of the tips in this article. It's a comprehensive source about all bugs in the garden, good and bad. I refer to it often! If you have any of your own tips for keeping harmony with bugs in the garden, please make sure to leave a comment below! we love roly pollies, I wondered if they were destructors of the garden. Interesting that they are both helpful and harmful. I will keep an eye on these little characters! 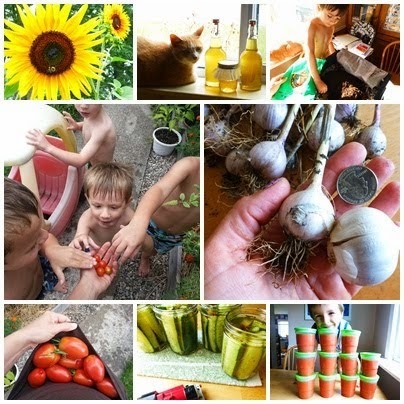 Thanks for sharing how to protect our seeds early fall and vegetable or fruits. I love gardening ,I have also a vegetable garden. . I plants some vegetable like potato, carrot,tomato, onion. Actually I love this vegetable. If you want to create a garden you can see this article. Thanks so much for this! My compost bin is COMPLETELY overrun with these little guys! I came inside to find out if they were good or bad, and I found this post. Is there a point where too many are bad for the compost bin, do you think? When I say overrun, I mean it! Hi! Thank you for your comment! I honestly don't think that you can have too many in your compost, unless your compost is really near your veggies and they might travel over easily. 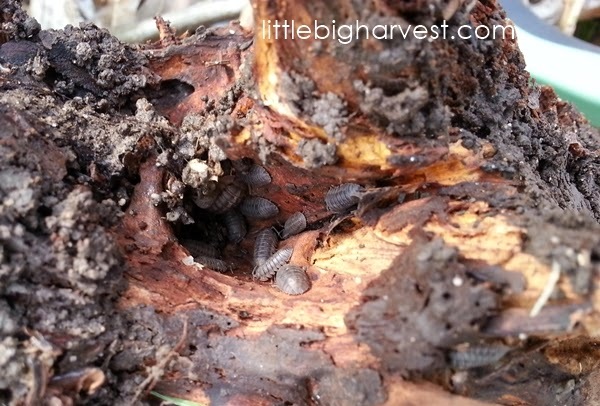 I think that lots of roly polies in your compost will help it become beautiful black gold more quickly. These creatures are natural composting machines! Make sure you turn the compost and cover it with brown materials (straw, dried leaves, shredded paper). I find that keeps the composting bugs in and out of sight for the most part. :) Happy Gardening to you! Thanks. I was quite surprised this morning to find pill bugs eating one of my young agave this morning. I recently replanted my raised bed and covered it with mulch...the agave may have already had a weak spot. I am going to plant in in its own clean pot for a while until it heals and grows a bit bigger. These creatures are natural composting machines! Make sure you turn the compost and cover it. Mark Hutchinson is very professional in the field of wild life from many years. I can't raise the leaves (like the hammock example) and I'm not exactly sure if they are harming my plant. This article was excellent but I'm still unsure as to what to do for my case.... Anybody? ?